Love letters straight from the.....HEART! I love letters....I love receiving letters! Do you remember waiting for the postman.....waiting for that all important letter or card....it was so exciting! Well I really think letter writing is on it's way back.....it most definately will be at Flora and Grace if I have anything to do with it. If you look back....go back as far as the war years and beyond many great love affairs were carried out purely through letter writing....how romantic just waiting for that letter to drop on the mat, then sneaking off to read the words of your loved one in private.....hellishly romantic....don't you think? At Flora and Grace I am designing some social stationery......starting with some very special personalised notelets I think these make wonderful gifts. All designs will be presonalised with your name/names, address, telephone number and email address. Their will be 6 or 12 flat cards with your chosen design and details on the front....your notes can be handwritten on the back of the card. Each card has a matching envelope and will be presented in a gorgeous box tied with matching ribbon and tag for you to put a message. The notelets can be purchased like this or you have the option of each box being adorned with a beautiful diamante embellishment for that extra special touch to your gift. Here are some of my designs so far......available exclusively to Flora and Grace in 2012! Hope you like them......I will upload a completely finished set with box, tag and embellishment tomorrow! As you know Flora and Grace has now become more than just a dream....reality actually....at last! I am due to open early new year 2012 but I need stock! I already will have my range of stationery in place but I guess it won't be everyones cup of tea so I will be looking for other artisan suppliers....is that YOU or a friend maybe....I would love to hear from you large or small businesses, private individuals please contact me! 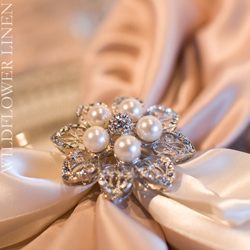 I am also looking for......wedding related items...bespoke, couture, artisan....something very different! With regard to service suppliers....the business is going to be in the Bristol area....so not too far out please! The list is endless....if you've come across anything in your search for wedding related items that you think are just that little bit different.....please contact me kim@zucchiniweddings.com or leave me a link or idea in the comment box below.....I would dearly love to hear from you! 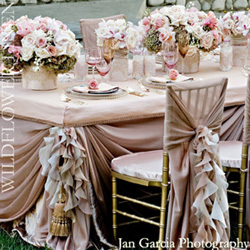 It's vintage style.....but it's glam!!! Just started working on some stationery samples for Flora & Grace which has been fun and fabulous! I've ordered some gorgeous lace and diamante embellishments for both wedding stationery and my flowers....they are in the post as we speak. So I had to use bits and bobs that I currently had in the studio.....those of you who read my blog will know that I'm terribly fussy when it comes to VINTAGE....it's personal taste....I KNOW.....but how can I design something that I don't like. I have used cardstock in pretty duck egg blue and mallow a very pale lilac teamed with matching ribbons, a touch of lace and then I made these little diamante and pearl embellishments to give that little bit of sparkle and a touch of glamour. 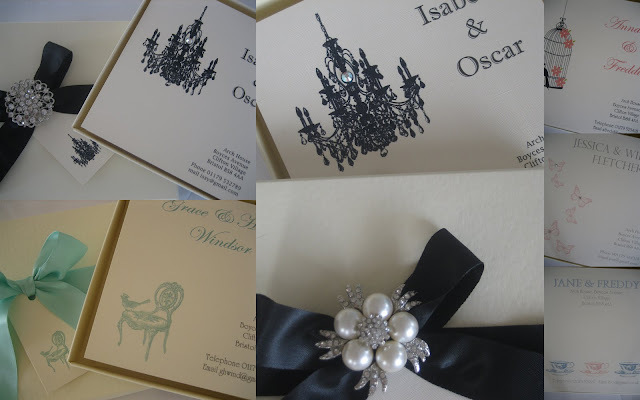 These delightful invitations come in a full range of colours and design can be changed slightly....I'm only showing a sample of a pocketfold invitation, favour box and namecard......you can have menu, order of service, tableplan and table names/numbers.....the list just goes on! All my stationery that you see over the next few weeks will be available instore at Flora and Grace in January 2012......and if you can't make that trip to Bristol you will be able to order online......email kim@zucchiniweddings.com details. If your looking for fun destination style invitations......maybe your marrying abroad.....here's some flipflop pocketfolds that I made for a client about two years ago.....just found the picture in my old camera and thought you might like to see! 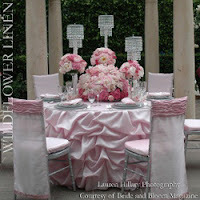 I've been searching the internet for stunning gazebo ideas for next years weddings in the UK! Karen Tran my trusted all time favourite came up with the lovely lilac idea......I also came across a very pretty white gazebo.....what do you think! Lovely lilac and white with just one or two peonies and orchids.......aggggh the costs!!! 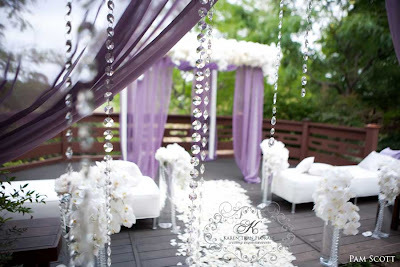 Lovin the idea of the crystal drops and dangles! 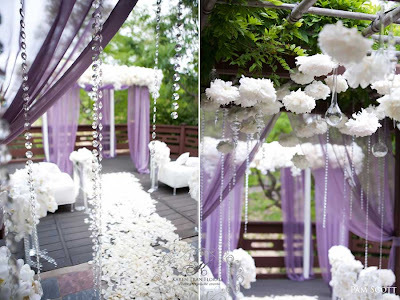 This is dreamy, white and very romantic....perfect! Just starting to build my portfolio for UK weddings....pretty much clued up on weddings abroad but the style back home is slightly different. I have lot's of ideas for styling venues, especially where the couple have their ceremony........! I'm not keen on couples just standing in a room or space to get married.....I like the idea of them being surrounded by surreal beauty as in the pictures above.......definately the need to create that stage or backdrop....... after all this is possibly THE most important performance of their lives. Lets face it we all love a bit of romance.....don't we? 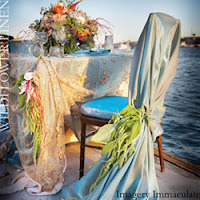 Just a couple of pictures....mainly flowers from recent weddings! Sorry for the wait my camera wasn't on it's best behaviour at the time and lots of my photographs didn't come out too well at all. Apologies for the pictures I didn't manage to get.......hey I'm no Mario Testino eh! 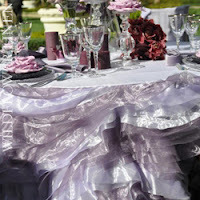 I know I keep on about Flora & Grace being different......but I always have tried thinking outside the box when it comes to business......I did this with Zucchini and it worked there still isn't a venue in Cyprus that could provide the kind of wedding with full, bespoke services that we offer to our lovely brides and grooms. If I enter the current wedding market with the same ideas as everyone else my business is going to sit in this niche market of current trends......I really don't want that for Flora & Grace I want individuality, I want to stand out from the crowd, I WANT to be different........and I will succeed in doing just that? One very important thing that I did with Zucchini Weddings was to never, ever offer a package deal......it was totally against my beliefs. How do you decide who deserves the platignum package and who deserves the silver.....Well you guessed it the availability of funds will determine that roll of this dice......Where is the individuality, why shouldn't each couple have exactly what they want for their special day? That was my philosophy for Zucchini and that will also be my philosophy for Flora & Grace? When I do my research on anything I always look at the very best the industry in that particular field has to offer.......Why not start at the top.....after all they didn't get to the height of their profession by being awful now did they? Over the last few months of serious research I have come across some fabulous people, ideas and products all of which, somehow I will incorporate into Flora & Grace......I may have to change things slightly, I may have to tone some stuff down but generally I'm aiming for the very best I can find for my clients and my business. 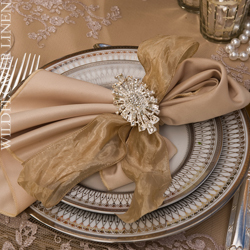 Beautiful napkins.......now take a peek at their chair and table coverings......unbelievable and I haven't even scratched the surface with these few pictures.....I've spent hours on this site! 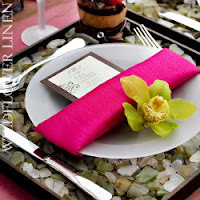 Photo credit......courtesy of Wildflower Linens! 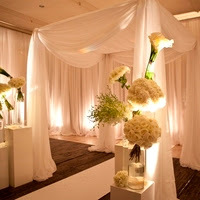 When the doors of Flora & Grace open next year I will be specialising in bridal flowers and venue styling! 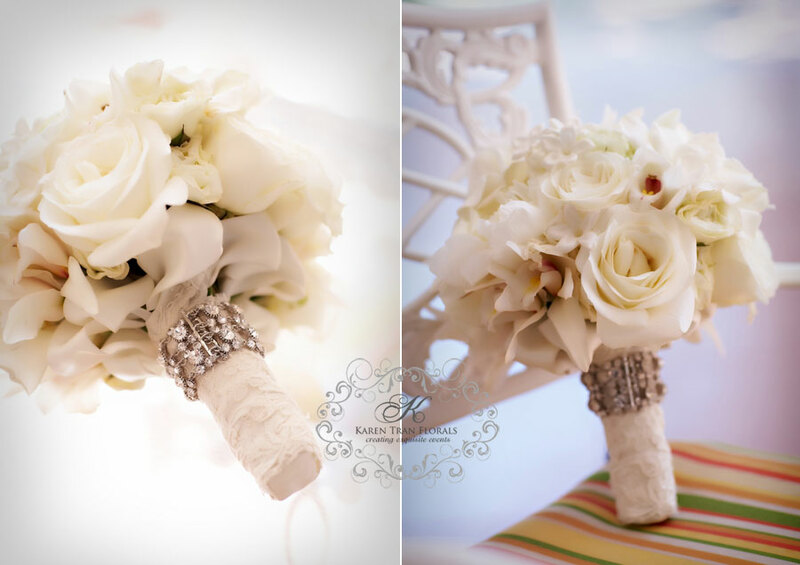 I really want to create bridal flowers with quite a difference using styles that I have come to love over the years. One of my all time favourite bridal flower designers is Karen Tran Floral Design her work is divine completely OTT but nevertheless divine! Karen manages to create bridal and venue floral design with such elegance....she uses an awful lot of sparkle in her designs.......but I love it. 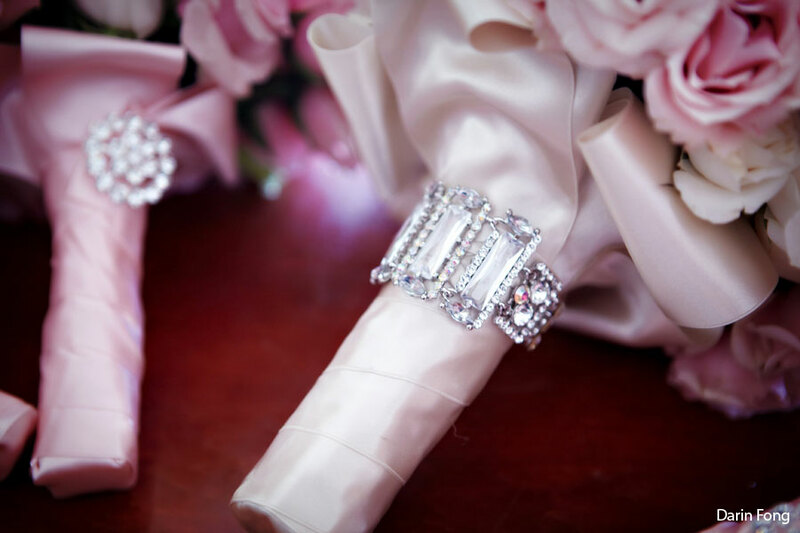 Sometimes BLING as we call it can look dreadful....not in this case it just looks stunning.....perhaps this is why Karen is one of the top bridal flower and event designers in America......working out of San Diego, California she is simply the best! 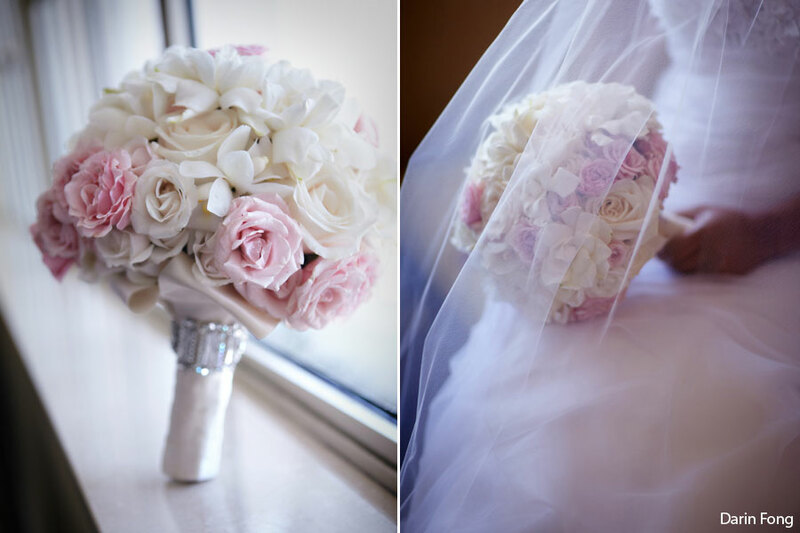 I have never been particularly fond of covering bridal stems totally before I discovered Karens work....now I'm hooked......take a look at these......gorgeous! 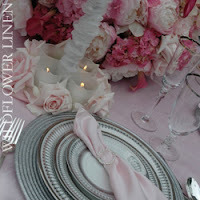 Photo credit Darin Fong.......Courtesy of Karen Tran Floral Design! 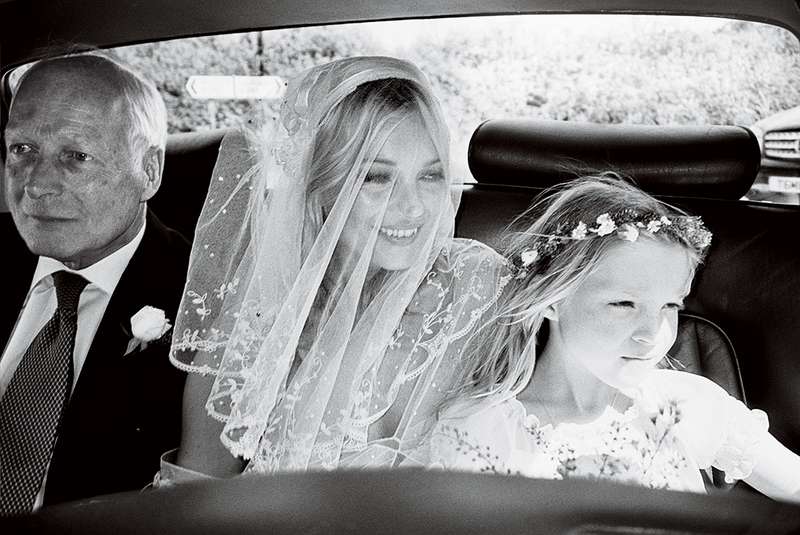 The most adorable pictures of the week....as seen in Vogue......the beautiful Mrs Hince......photographed by the HUGE TALENT....Mario Testino.....what a dream team! Have a read of the article on Vogue.com beautiful scribblings of Hamish Bowles.....felt like I was part of the wedding party......great read.....how the other half live. I think you'll agree Kate managed the look which she set out to achieve! A very large part of my new life in the UK will be Flora & Grace.....in fact much the same as Zucchini Weddings has been for me over the last ten years.....I've had the learning curves....I've made mistakes.....I've learnt so much about weddings, flowers, styling, what works, what looks awful......I've had some fun.....I've cried with tiredness doing a wedding everyday (like in September).....but most of all I sincerely hope I've made some people very happy? So to a new chapter in my life my gorgeous little boutique.....nestled in the heart of Clifton village in Bristol is an absolute gem....of course it's going to be very beautiful....almost like walking into a fairytale.....a wedding fairytale. This is quite a dream come true for me....something I have been planning for some time and the great thing is I'm going to have much more of a family business and there is quite some hidden talents in my family. I really do want my business to be terribly different and that's going to be the hard part setting myself and the boutique up and being different enough to make all the difference.....if you know what I mean. The boutique is tiny but perfect for me to start with.....it's currently trading as a bridal shop.......the delightful owner (soon to be revealed) is moving to a fabulous new shop just around the corner. It really is going to be the most beautiful bridal gown emporium situated over two floors....and wall to wall designer dresses! I hope to be working quite closely with the owner of the new boutique...can't wait. I actually met the lady in question on Twitter....she was advertising her shop for rent....well the remainder of the lease....I just happened to be visiting the UK two days later...the rest is history.....Clifton here I come.....well it's actually home for me that's where I lived with my family from about the age of five or six.....so I guess I'm going home! They say small is beautiful and in my boutiques case this is going to be just so....The shop front has a very pretty window, the shop itself is quite long with a staircase of about six steps leading to another area almost like a small gallery. 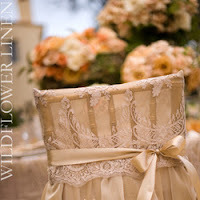 This part of my boutique will be called 'The Wedding Room' at Flora & Grace. Although I plan to have stock in this area as well as the rest of the retail space I want this room to have a pretty seating area where I can entertain clients who wish to discuss their wedding with me.....and of course Alex. A large part of the business will be wedding planning and styling....very much what I have been involved with in Cyprus. 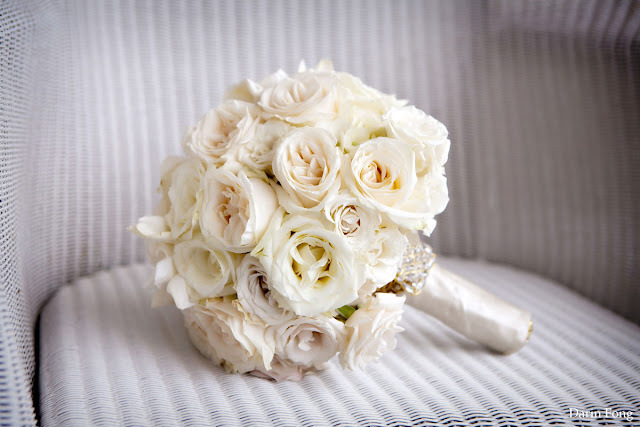 Another huge part of the business will be dedicated to my love of flowers.....specialising in bridal and other wedding blooms.....much emphasis on venue styling. I particularly want to focus on using beautiful stem detail for my bouquets something I really think will make my bouquet stand out from the crowd...so to speak! I am in the process of sourcing different styles of brooches and other bits and pieces that will look lovely with flowers. I am also very keen to incorporate jewellery, lace and other pieces into fresh flowers....in a very difffernt kind of way...watch this space. 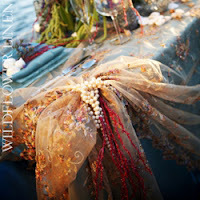 The rest of my retail space will be dedicated to everything wedding.....but again with a difference. Why stock something you can easily purchase elswhere....no point! 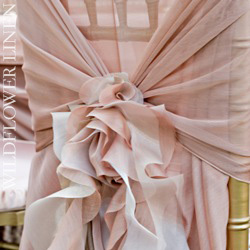 I'm also not a huge fan of following wedding fashion...THE TRENDS of the moment. I am aware of all the vintage hoo ha and granted some of it can be very pretty.....when it's not looking too confused and some of the styling that I have seen does look just that....CONFUSED.....what era is THIS supposed to be from? Please don't get me wrong I'm not knocking vintage and I have to use the vintage theming in quite a lot of what I produce for brides at the moment but I take the pretty bits and they have to be relevant. I've yet to meet anyone that has truly styled a very vintage wedding throughout.....this is where the confused bit comes in There's usually a hint of vintage with an old typewriter or a battered old picnic hamper, a bit of tatty bunting here and there.....the odd vintage jug full of wispy country like flowers on the table.....come on where's the glamour......where's the oppulence......well I haven't seen any on my internet travels so far.....prove me wrong......maybe I've been looking in all the wrong places? Having said my piece about vintage I do have the pleasure of styling a wedding that's coming up soon and that does have lots of vintage elements to it.......but they are tasteful and THEY do have that touch of glamour that so much of the vintage styling lacks....let me get some pictures of this wedding and you'll see what I'm trying to get at....sorry there is a little wait for pictures the wedding isn't until September.....be patient! So I want and WILL BE be very different in my approach and design of my weddings....I will have that glamour, romance and timeless elegance.....I promise....just watch me!!!! 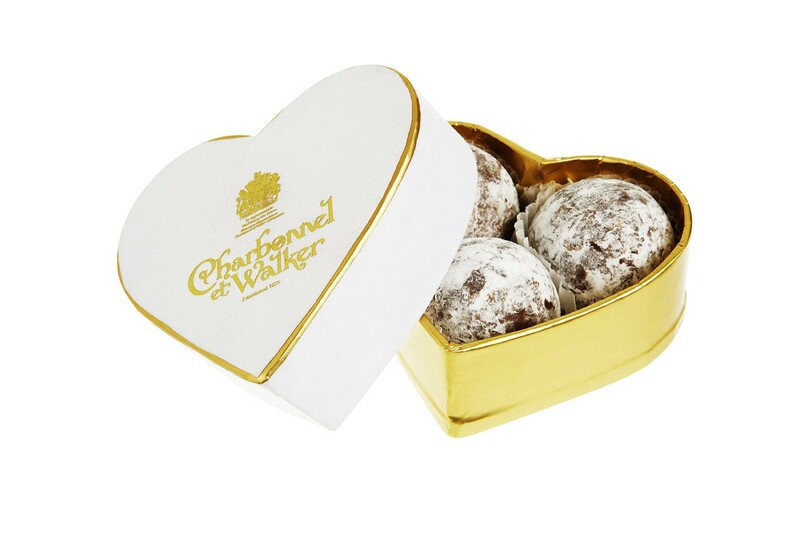 One of my favourite chocolate shops when I worked in London was......and still is Charbonnel et Walker ! Situated in one of the cities beautiful arcades in Mayfair this delightful little chocolate shop still exists. I always used to buy these delicious morcels as presents.....they never dissapoint and the boxes were always pretty to keep. 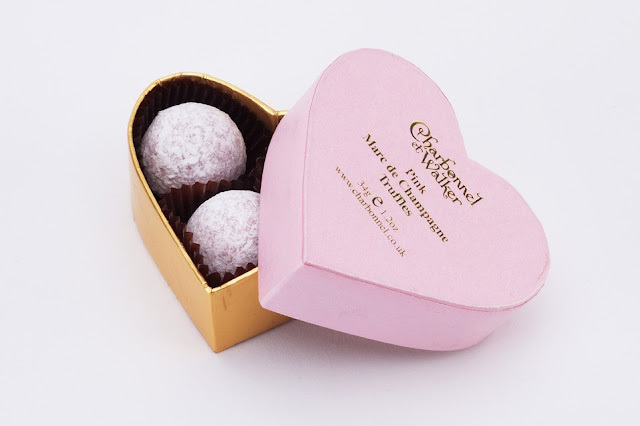 I came across these pretty chocolate boxes and thought what a pretty wedding favour.....certainly very chic! I am currently looking at stocking them in Flora & Grace when I open early in 2012......what do you think? 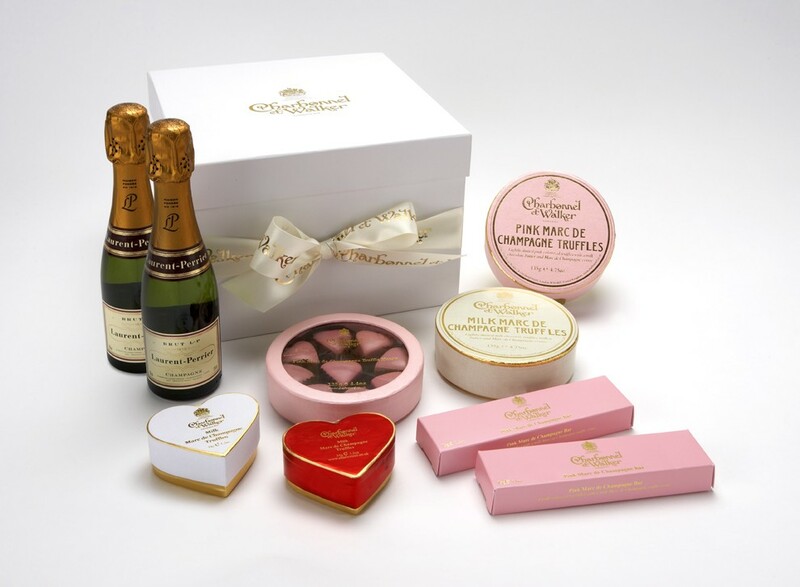 They also do a beautiful chocolate hamper.....a perfect gift to share with your new hubby on the night of your honeymoon......how romantic chocolates......just add a couple of mini bottles of Laurent Perrier and yo have the perfect romantic gift. Why not treat your bridesmaids........a little pricey granted......but they'll love you forever! PS........don't forget the straws for the bubbly....ENJOY!!!!!! This week has been fantastic.....slightly manic but with four weddings what do you expect? No seriously, lovely week with four very different weddings ranging from the small and intimate to the slightly larger soiree we've had a ball. I did manage to get some pretty pictures which I will post later today! My week so far.......in flowers started off on Monday with beautiful ivory mini calla's moving on to a hot pink and purple theme.......I also did personalised namecards, menu's and order of service for this wedding......very summery. 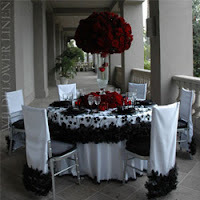 The flowers were beautiful, very....JUST PUT TOGETHER look....which I love. I used the stunning 'Sonia' rose which is hot pink, purple Llysianthus and purple Veronica intermingled with white and hot pink lilies.....looking forward to showing you the pictures later. Today I have ivory Avalanche roses with lilac Freesias for the more romantic look.....then tomorrow we have Scottish wedding which I am incorporting the Thistle......again we have a white and purple theme. Gemma is having a vintage cupcake theme and she has brought a lovely cake topper from Leah Halliday....Notonthehighstreet.com I'm looking forawrd to showing you this it's very sweet! See you later with photographs.......have a good day!